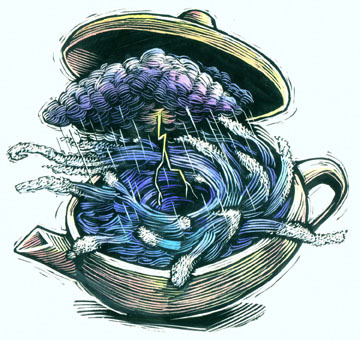 This scratchboard was for Institutional Investor magazine, and they had asked me to illustrate the idea of a ‘tempest in a teapot’. I seem to remember doing this one twice, and my first version wasn’t nearly ‘turbulent’ enough, so was asked to revise it. I don’t know what ever happened to the first version.